Hi girls, I like to share the review of one of my best product that I have ever used since, that much I love this product. It makes my skin so soft and nourishing. It has a 3 way care to protects, moisturizes and nourishes our skin. Overall it gives an amount of moisturizer which your skin wants not more than that. If you once tried this product means you never live without this cream. 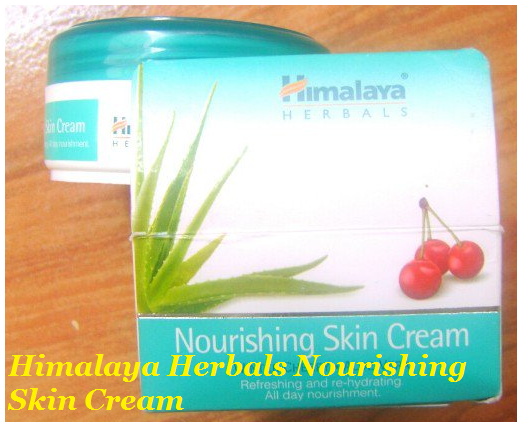 Let we see the review of Himalaya herbal nourishing skin cream. SHELF LIFE: APPROXIMATELY 3 YEARS. Aloe vera (Barbados Aloe, Kumari). Pterocarpusmarsupium (Indian Kino Tree, Bijaka). Suitable for all skin types, Refreshing, re-hydrating and all day nourishment. A gentle blend of herbal extracts that restores skin vitality. Himalaya Herbals Nourishing Skin Cream is a light and non-greasy daily use cream, that provides you all day moisturizing, nourishment and protection. It is enriched with aloe vera which nourishes and moisturizes, and Winter cherry and Indian kino tree extracts, that protect your skin from pollution and dry weather. It is very effective nourishing cream for dry skins and it can be very useful during the winter season. It can’t be applied on your face you can apply it on your body parts like hand, legs etc… It helps to protect our skin from pollution and it moisturizes our skin. It is light and non-greasy cream, so that combination type skin girls also can give a try. I too have a combination skin I have been using this for a month and it works on my skin awesomely. Apply this cream as per your requirement after taking bath. I promise you it will definitely make your skin nourishes. It is light and non-greasy. It nourishes our skin and makes it soft and supple. It protects our skin from pollutions. It moisturizes our skin so nicely and gives a smooth texture to our skin. It has a long shelf life for about 3 years. We require only small quantity to nourish our skin. It doesn’t contain any sulfates and parabens. It can be used only in the winter season, because it nourish and moisturize our skin, so during winter season only we have dry skin, so it can be beneficial during winter. It doesn’t work for oily skin peoples. Comes in tub, so some girls may feel not hygienic because we have to take cream using our finger every time. It may be messy for some girls. The cream will spread over the lid of tub when take it for your journey. It is not a travel friendly product. WILL I REPURCHASE IT: Sure I will definitely repurchase it, I inspired with this!